Wishmaster (1997) Review – AiPT! The ‘90s didn’t produce a whole lot of strong horror franchise characters. We got Candyman, the Leprechaun, Ghostface and… who else? The Fisherman? Indeed, the horror genre was deemed passé for most of the ‘90s, so memorable series-carrying characters weren’t the order of the day. However, toward the end of the decade, we did get one who showed some serious promise: The Djinn. He had the air of a slasher about him, but with the usual ‘90s twist, separating him from the masked, knife-wielding maniacs of the ‘80s. He had a clever gimmick which opened the door for some interesting stories, and very interesting deaths, and a unique appearance and backstory. Truly, the Djinn had the potential to become a horror movie icon in his own right, but never really found a large-enough fanbase to support him. I suppose it didn’t help that the slew of straight-to-video sequels that immediately followed the original Wishmaster essentially dragged the series through the mud. Centuries ago, a demonic creature called the Djinn (Andrew Divoff) was trapped within a bloodstone and sealed inside a statue. The Djinn has the power to grant wishes, but being a malevolent force, all the wishes he grants go terribly wrong for the wisher. Fast forward to the present day and the jewel within the statue has been released. Antiques appraiser Alexandra (Tammy Lauren) gets a hold of the bloodstone and inadvertently summons the Djinn. Alexandra is reluctant to make her three wishes, because as soon as she does, the Djinn will be free to unleash more of his kind upon the Earth. In her delay, however, the Djinn grants wishes to various simpletons across the city, collecting their souls after each wish goes wrong. It’s most likely that whatever opinion you have of the Wishmaster franchise is based on the obnoxious sequels, which received nauseating amounts of airtime on the Sci-Fi Channel and sported all the quality of one of their “Original Movies”. The three sequels were released in rapid succession (all of them coming out between 1999 and 2002) and seemed to be reduced to little more than parodies of the original by the end. We haven’t had a Wishmaster sequel since and that’s probably a blessing. Still, try to remember that ancient proverb: “Never judge a movie by its sequel”. The first Wishmaster has its cheesy moments, sure, and it isn’t exactly the stuff of “Legendary Horror”, but it is still a fun, entertaining horror movie of the Rawhead Rex or The Brain variety. Writer Peter Atkins and Director Robert Kurtzman are aware that the main draw of the movie is the gruesome deaths brought on by the wishes, so they never spare an opportunity to let one fly. The story and characters are fine, but serve only to get the Djinn from one kill to another. And the kills are pretty awesome. One of the franchise staples happens to be bizarre, surreal and grotesque all-out massacres in crowded rooms. Future films would get sillier and sillier with this, but the original Wishmaster features two absolutely balls-to-the-wall insane slaughterfests (one at the beginning and one at the end). I’m talking people being turned into monsters, vomiting up their organs which in turn sprout tentacles and kill other people, people turning to glass and exploding, statues and paintings coming to life and chopping everybody up and even one kickass moment where a guy’s skeleton rips itself out of its own body and goes on a killing spree. It’s all so ridiculous and yet so very, very amusing. Between the big massacres, you’re treated to a dozen or so individual punishments that are all wonderfully ironic. A woman who wishes for eternal beauty is turned into a mannequin, a guy wishing to “escape” is locked up in Houdini’s water chamber, a douchebag wishing for a million dollars gets it in the form of his mother’s insurance policy after her airplane explodes… and so on. Divoff’s performance as the Djinn is great, oozing pure evil with every word, and even his portrayal of the Djinn in human form has a certain sliminess to it. My only real issue with the Djinn was that he occasionally spouts off some Freddy Krueger-esque dialogue that’s meant to be funny but instead seems out of character with how he’s portrayed in other scenes. He’ll talk in an ancient, regal tone for most of the movie then randomly blurt out some modern slang. It’s kind of funny, but not really. So far as the rest of the cast goes, well, Tammy Lauren just plays your typical horror movie heroine; nothing to see here. The actual fun comes in spotting the cameos by several horror movie icons. Keep an eye out for Kane Hodder, Ted Raimi and Tony Todd. Robert Englund also has a large role. Oh, and they all die in some horrible fashion. Yippee! The end solution to the conflict is, as in any tale about wishes gone awry, a matter of outsmarting the Djinn. The way Alexandra outthinks him is somewhat clever, or at least it wasn’t the wish I was expecting her to make. The Djinn’s powers occasionally backfire on him during other scenes in the movie, which provide some genuine levity. 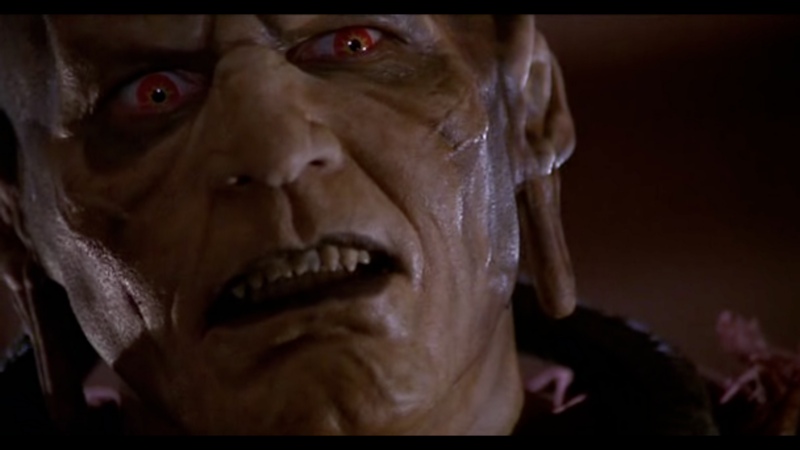 If Wishmaster suffers from any major flaw, it would have to be the uneven special effects. The movie tries to combine traditional make-up and prosthetic effects with “state of the art” CG. The CG looks uniformly awful by modern standards, though I recall it wowing me back in 1997. The traditional effects look great at certain times and extremely rubbery at others. The bad effects mostly rear themselves during the massacre sequences, so no single shot is dwelled upon for too long, thankfully. The original Wishmaster is a kinda bad but entertaining horror movie. When I watch it, I can’t help but rage over all the wasted potential. Had they committed to quality over quantity, we might have gotten some decent sequels. As it is, you’re better off just sticking with the first film. It’s available from Artisan on a double feature DVD with Wishmaster II, which is probably the least offensive of the follow-ups.